With Navien Condensing, you get the best of both worlds: the Best Value and “Ultra Condensing Efficiency,” which offers substantial savings and contributes to a green-friendly environment. Plus, the installation and venting processes are easy, cost effective, and Navien’s products are simply the best in quality and performance. Navien’s condensing efficiency boasts the industry’s highest efficiency. Customers can take advantage of the low annual operating costs and receive the best value and payback, compared with conventional tankless or tank-type water heaters. Navien utilizes dual stainless steel heat exchangers, providing a longer life-expectancy and more resistance to erosion than copper heat exchangers used in other water heaters. Navien’s stainless steel heat exchangers operate with relatively low water temperatures, minimizing damage from hard water conditions and maintains a high efficiency level. Navien’s Condensing Tankless Water heaters offer an unlimited supply of hot water to meet a home’s unending demand for hot, soothing water! 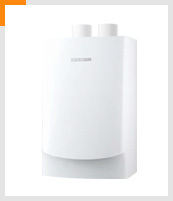 The high efficiency of Navien’s Condensing Tankless Water Heater results in lower exhaust temperatures, allowing for the use of 3″ SCH 40 PVC venting. • PVC venting offers a significant cost savings when compared with other venting materials. • PVC venting is lightweight and easily slides together, reducing installation time and making it easy to run a 100 feet of venting. • Navien’s condensing technology uses less gas than conventional water heaters, resulting in less CO2 emissions. • The Eco Pre-mixed Burner dramatically reduces NOx emission levels, making it the lowest emission levels in the industry. Each Navien Unit Installed Equates to 31 Cypress Trees. A Navien Condensing water heater reduces up to 964 lbs of CO2 per year compared to a conventional water heater, and up to 324 lbs of CO2 per year compared to a tankless water heater. • The Ready-Link® Cascading System can combined “A” models units and non “A” model units together to save money on installation costs and conserve water. Navien’s condensing tankless water heater’s compact, wall mount design occupies approximately 80% less space than a traditional 50 gallon tank-type water heater*. Navien’s compact design adds free space that can be used to store other house hold items. Navien’s two microprocessors offer better control and safer operation by continuously cross monitoring each other’s performance to assure proper operation at all times. These two microprocessors not only control the burner for ideal combustion but also maintain the steady hot water temperature. APS (Air Pressure Sensor) maximizes combustion efficiency by sensing and controlling the air required for optimal combustion even in high-wind locations and installations with long vent runs. GPS (Gas Pressure Sensor) offers stable combustion by sensing gas pressure and controlling the fan speed to maintain optimal combustion, even under a wide range of gas-pressure changes. Controls flame by pre-mixing optimal ratio of gas and air before combustion, reducing emissions and enhancing heat efficiency. Built-in leak detector prevents damage to water heater as well as personal property. An air intake filter prevents foreign substances, such as dust or insects, from entering the system, freeing the burner from elements that would normally cause unstable combustion or energy inefficiency.